A great way to take in an event at the United Center in Chicago is to acquire Club Level Seat… ahhh. Unobstructed views, comfortable seating, convenient parking, a private concourse, complimentary coat check service, in-seat waiter/waitress service, and much more! 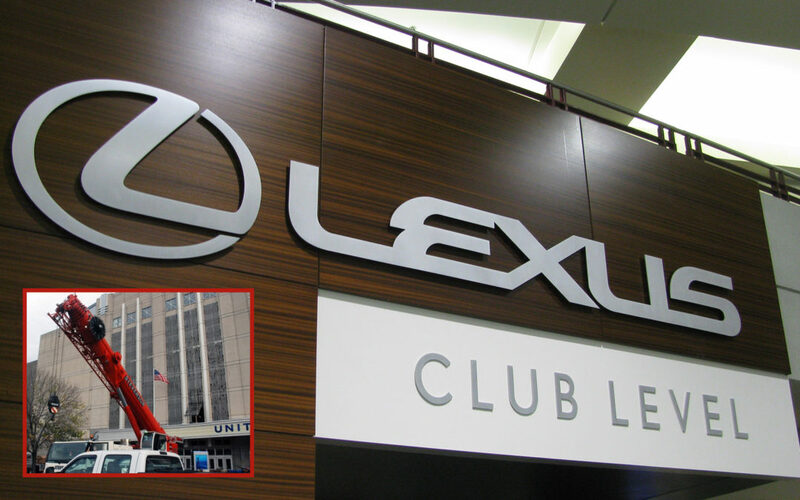 Lexus thought so highly of the Club Level that they paid to become a sponsor. This gave Lexus naming rights, banners, displays, photos, and what about automobiles? 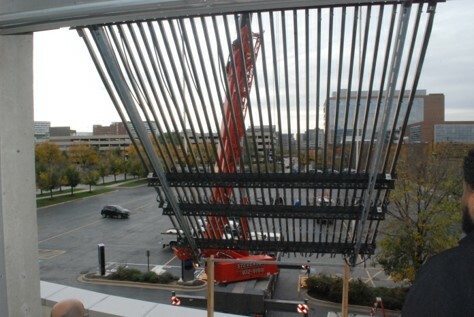 A Stevenson Crane lifts the video display so the United Center engineers can tie it off once open. Nothing says take me home like a real live automobile. Great idea! Just bring a couple of cars in from the local dealer. Now all you have to do is get them on the 200 level 3 floors up. There must be an easy way to get these Lexus’ on that Club Level, right? None of the United Center’s elevators are large enough to fit an automobile. I know. Just drive them up the stairs. Not an option – permanently mounted hand rails, low ground clearance on the Lexus’, and just plain old dangerous thing to try. Stevenson Crane riggers ensuring lift points and ramps are set properly on the platform. The building engineers at the United Center and riggers from Stevenson Crane Service got together, studied options, and formulated a plan. Nobody said it was an easy plan, but it was a doable plan. Enter through the third floor window (which is obscured by video displays). To accomplish this there would have to be modifications to the United Center’s facade. The United Center engineers were up to the task of preparing the plans, getting proper approvals & having the necessary work completed. Taking a portion of the window out & replacing it with double doors. Cutting & hinging the video panel so it could swing up. Extending the wiring on the video panel to allow for the swing. A method to tie-off on the roof to hold the display up. A Stevenson Crane operator skillfully lifts the platform with the Lexus on it to the Club Level. 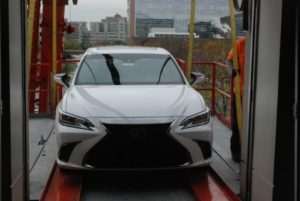 Meanwhile the riggers at Stevenson Crane Service were busy designing a platform on which the Lexus’ could be loaded and lifted to the Club Level. 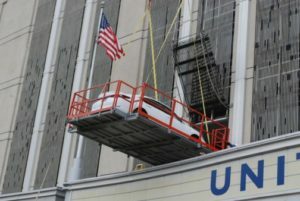 The opening in the United Center did not allow for more than an inch of clearance on either side of the automobile. Thanks to all the planning and great teamwork between the United Center crew and Stevenson crane taking last year’s models out and replacing them with new models was accomplished safely and without incident. The specifically designed ramps perform beautifully. The Stevenson Crane team was able to complete this project on-time & on-budget. 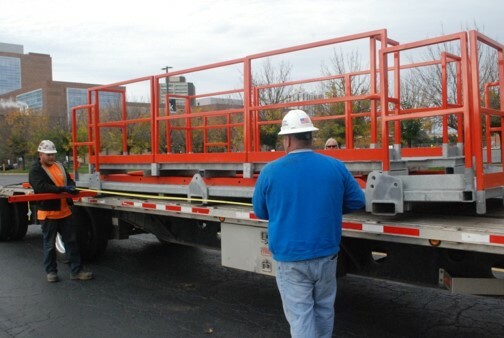 If you have any questions about this blog or have your own lifting project(s) coming up please contact Stevenson Crane at 630-972-9199 check out https://stevensoncrane.com or leave your comments below. Please consider sharing this blog with colleagues who might find it helpful. Keep An Eye Out For Future Stevenson Crane Blogs! Stevenson Crane, Rigging & Heavy Haul is a national leader in rigging & heavy haul, crane & aerial lift rentals, crane sales, crane service, & aerial lifts since 1989.